Electronic Union Organizing Starting To Appear Online - CUE, Inc. 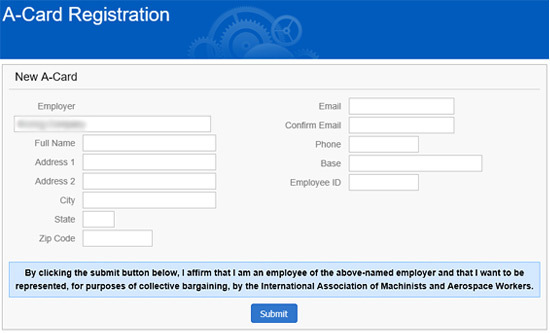 The first examples of electronic authorization card collection site by union are beginning to appear on-line following the recent announcement by the National Labor Relations Board that they would begin accepting electronic signatures for purposes of filing for a union election. Links where employees can sign electronic cards like the one depicted here are showing up in print media, as well as online via websites and links on social media, including Facebook. “This policy enables the Board to expeditiously determine whether representation proceedings are warranted and to do so in a manner, that to the maximum extent possible, preserves the secrecy of the individual employees’ views”. Authorization cards are used to show support for the union and to petition the National Labor Relations Board for a representation election. Until the new NLRB rules were issued on September 1, 2015, employees typically signed paper cards. Whether this turns out to be an effective strategy remains to be seen, but we will surely see more examples of this in the future.